When I was out running errands the other morning, one of my stops was Target. We love TARGET. I had finished shopping and was heading out of the store, and came around the corner to the exit doors, and encountered … CARTS, lots of red CARTS. I stopped short, as the guy who was in charge of wrangling the carts was moving a long line of carts into rows in their designated space between the automatic doors of the entrance and the exit. Did I say…lots of carts? But, what I did was that usual thing that happens with estimation, once an idea is put out there, most of us model our guess after the estimate that is offered first. I moved my guess into alignment with his and figured about 75–about 5 rows of 15ish. This is exactly why in a class you use the estimation 180 method–a guess that is too high, a guess that is too low, and then your guess. And then, everyone shares out–after there has been enough time for everyone to consider all that needs to be considered. So, I counted the next row, and got 23 carts, and because I could see that each of the next two rows were the same length, and there is a nice constant with the cart length, I knew there were 46 carts combined for rows #2 and #3: 2 x 23. Now we were up to 46 + 14. That left the last 2 rows. My co-cart conspirator counted the 4th row and found that there were 20–and then he stepped away, added more carts to the last row to make it the same length as the row he just counted (row #4)–doubles strategy. Voila! We had our final count: 14 (from row #1) + 46 (rows #2 and #3) + 2 rows of 20. We smiled and nodded–I snapped a couple of quick photos–and we went on our separate ways. 2. Cool guy at Target–super fabulous of him to play along and help me out. 3. Doubles strategy. We used it a few times: once to count rows #2 and #3, and again, to even out the last two rows so as to make that nice round set of 100. 4. And now we have a fun context for a great number exploration or a number talk and an estimation 180 all rolled into 1 to use to answer the question: How many carts are there? 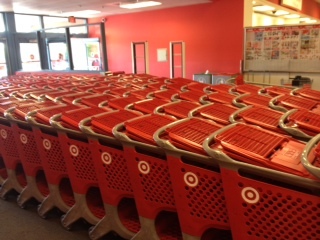 Can’t you imagine the big white boards or big pieces of sticky back chart paper and markers out on the tables for kids to use and off they go to find a bunch of different way to figure out how many carts were at Target the other morning? What strategies might we see the kids using? My predictions: doubles, make ten, break apart by place value, adding up in chunks, open number lines, adding on…so many options and this makes for great conversations and discourse. 5. A warm up for a percent lesson I saw in a class I was working in last week–need to still get permission to use the teacher’s idea. The work was focused on percents, and since we have 100 carts, we should be able to do construct a problem sequence that offers great opportunities for interesting conversations, conjectures, and discussion. 6. Finally,…a place to fit in the post about arrays that I have been thinking about so that it wouldn’t be so random. Stay tuned…may actually make a go at the 30 blogs in 30 days challenge that is floating around out in the mathtwitterblogosphere. Dare I say 1 out of 30 (or 1 down 29 to go)? Thank you for your note–appreciate you taking the time to read the post in the midst of your very busy day. This is a great mathematical thinking task! Also, I LOVE target. Thanks for your note–read your work–but am not so great at leaving notes…need to work on that. An aside–how can you not love Target. I’m terrible at comments, too. I’m working on it for this challenge. Love reading you take on math is everywhere. Ps, Thanks for the help with Barbie Bungee. Yep, your nephews love 100, it’s funny how everything big seems to be 100 to them! It will blow their young minds when they figure out there’s a lot more past 100…! Crazy how 100 has this super power for kids!! Hugs and a big hello to my brilliant nephews.